1.2 Why do we need decimals? Counting with decimals hasn’t always been so evident. 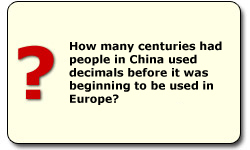 In China, they began using it already in the 300’s, while it took until the 1500’s before the decimal showed up in Europe. Decimal calculations came to Sweden first around 1625. In the beginning of the 1600’s, the first Swedish textbooks in mathematics were written. They were often written in Latin and contained information from other countries. Fractions were used when calculating parts of a whole number. Because of this, it wasn’t until the 1800’s that people began calculating with decimals in Swedish textbooks.